The class model shows static class objects (named boxes) in an object-oriented software system and the relationships (lines) between them. Two important relationships are generalization (inheritance) and aggregation (whole-part). 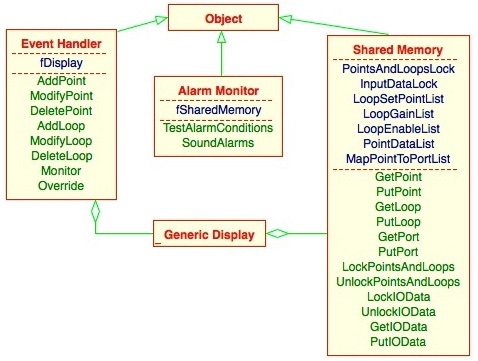 Each class object on the diagram often shows the class name, its attributes and operations. Details like data types for attributes and arguments for operations can also be shown on the diagram for some notations. Many class modeling notations are available but most developers have standardized on UML as illustrated here. A Class Diagram is one of the most important diagrams in the UML Notation.